If you want to lose weight a diet high in fibre can help you. Fibre-rich foods tend to be low calorie and also bring health benefits so it’s worth considering your diet and thinking about ways to increase the amount of fibre you consume on a daily basis. Research indicates that most adults in the UK eat, on average, 12g of fibre a day. Recommended guidelines suggest we should be upping that to between 18 and 24g daily, in effect, doubling the amount of fibre we eat. Small changes to your diet can make a big difference to your health and your weight. Why is fibre good for me? Research suggests that a diet rich in fibre helps protect against certain cancers, heart disease and gastrointestinal conditions such as diverticulitis and duodenal ulcers. From a weight-losing point of view foods rich in fibre are helpful because they fill the stomach helping to reduce appetite and make you feel full for longer. Most are low in calories. They also improve digestive health by speeding up the passage of food through the gut and can reduce constipation. And, because fibre-rich foods tend to take more eating, more chewing, it takes longer to finish a meal, giving your stomach time to tell your brain that you’re full. It takes about 20 minutes for the message to get from your stomach to your brain, which is why you sometimes feel over-full after a meal: the message didn’t get there in time to stop you eating those extra mouthfuls! Fibre is made up of complex carbohydrates that can’t be digested by the body. There are two types of fibre: soluble and insoluble and each has different benefits. Much of the food we buy and eat these days is processed to some degree or another. The more processed it is, the less fibre it will have. Food processing also removes many of the vitamins and minerals that we need too. So when out shopping, opt for wholemeal bread, wholemeal pasta, brown rice and whole cereals. 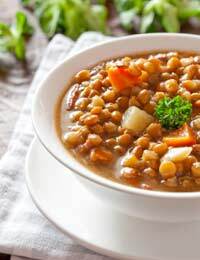 Pulses, beans and lentils, and fresh fruit and vegetables are also high in fibre. You may have noticed that some foods are advertised as ‘fibre-rich’. In the same way that ‘low fat’ foods often contain more fat than you’d expect, some of these products don’t live up to their claims. According to the Food Standards Agency, to be able to claim to be rich in fibre a product must contain at least 6g per 100g. So, as with fat, be label conscious. Check exactly how much fibre it contains. If you decide to increase your fibre intake do it gradually. It will take a while for your body to adjust. You may find that you suffer from flatulence or, strangely enough, constipation at first. The flatulence is the result of the gases produced by fibre in your intestine; more fibre will also soak up more liquid so if you don’t increase your water intake to keep up with it, you could become constipated. In time your body will adjust to the changes and you shouldn’t find it uncomfortable. Research has shown that people who eat breakfast are more likely to keep weight off; fibre-rich cereal fills you up and keeps you feeling full longer. Therefore a fibre-rich cereal for breakfast must be a good thing. Adding a spoonful of bran to your breakfast cereal used to be suggested as a way of increasing fibre in your diet, but not only is it fairly unpalatable it’s now been shown that bran can reduce the absorption of some vital minerals so isn’t recommended. Much tastier is to enjoy a low fat fibre-rich wholewheat cereal with semi-skimmed milk, or a bowl of nourishing oaty porage. Increasing your consumption of fruit – including the skins – and vegetables, especially leafy green ones, not only increases the fibre level but is a delicious very low fat way of doing so. Baked beans, everybody’s favourite, are another good source of fibre and they’re virtually fat free. Make chilli con carne with extra kidney beans or add lentils to a vegetable stew. With a little thought it’s possible to increase your fibre intake very easily, helping your weight loss and without your family noticing that you’re improving their diet and giving them good habits for life. Put all the ingredients except the coriander in a large pan and bring to the boil. Cover and simmer for about 20 minutes or until everything is tender. Liquidise, check seasoning and reheat if necessary before serving sprinkled with chopped coriander.